Diabetes is on the rise, but why? If you haven’t noticed already, diabetes is getting more and more common. The most common type is now known as “Type 2 Diabetes”, but only a few years ago it was called “Adult Onset Diabetes”. The name had to be changed as younger and younger people were developing it! But why can this be, and is it inevitable that we’ll get it if someone in our family had it? The answer is most definitely no! Because there is so much misinformation and misunderstanding about diabetes, and because it would be hard to get all the facts down into this blog, we’ve decided to hold a Diabetes Health Day. There will be lots of different sources of info on the day with the intention of showing you that there are so many simple things you can do to drastically reduce the chances or getting diabetes, or reversing your diabetes if you’ve already been diagnosed. It’s not inevitable or ‘genetic’ and you can make a difference to your health. Whether you’re a patient of ours already or not, everyone is welcome. 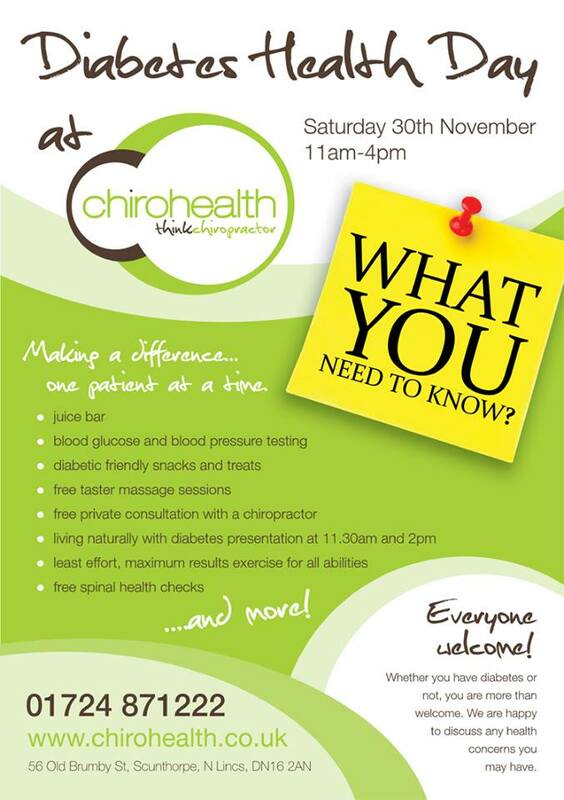 We’d love to see you there on Saturday 30th November from 11am and please bring any of your friends or family that you think need to get the facts. Here’s a copy of the printed flyer that we’re distributing. You may also see it in the Scunthorpe Telegraph too!